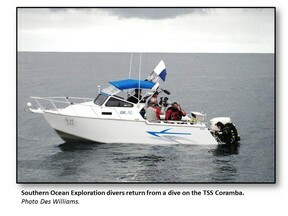 Southern Ocean Exploration (SOE) is a non-profit group of explorers, educators and sub-professional maritime archaeologists who locate and record what lies undiscovered in the expansive coastal waters of Southern and South Eastern Australia. 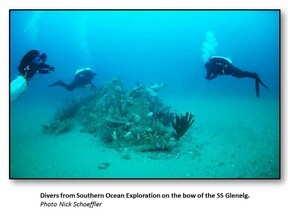 SOE believe that as divers we have a role to play in extending the boundaries of diving and the recording of the sunken history that lies beneath our oceans. Non-divers are an integral part of the exploration and we welcome any new ideas or adventures that may assist in our quest. We are always looking for help, any new information, a new project or the latest challenge to extend the boundaries of what we do. Warning: Scuba Diving is a potentially dangerous activity. 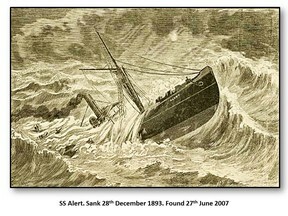 Neither Southern Ocean Exploration, contributors, nor webmasters accept liability for any injuries incurred by persons using information obtained from this site. All materials are provided for information purposes only and are not to be used as a substitute for correct diver training by a suitably qualified professional.